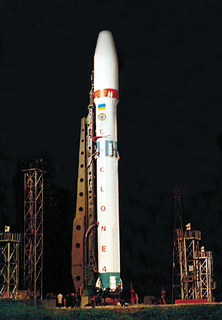 Brazilian Space Agency (AEB) President Marco Antonio Raupp is leading a technical committee on a tour of Ukrainian companies, factories and agencies this week as part of the joint program to launch Cyclone-4 rockets from the equatorial Alcantara Launch Center in Maranhão. Brazil has begun overseas marketing of its launch services, which are set to begin by 2013, and endeavored to strengthen its space ties with other nations. Those efforts included outreach to Canada and Belgium in space cooperation and higher education at the end of June. Brazil’s Minister of Science and Technology (MCT) Mercadante proposed several new partnership during a June 28 meeting with Canada’s International Trade Minister Edward Fast, MCT said in a press release. The minister [Mercadante] also spoke of the intention to enter into partnership also in the construction of satellite launch vehicles. “We have a base to two degrees of the equator and that, therefore, is a huge advantage in launching rockets. We are building the Cyclone – 4. The idea is that we develop the rockets and you (Canada), the satellites,” he said. In addition to the Ukrainian rocket, Brazil is also developing a smaller Satellite Launch Vehicle (VLS) for smaller payloads. AEB is working with the Russians on advanced propulsion for that rocket and other projects. Brazil and Canada have been expanding cooperation in high-tech fields since signing the Framework Agreement on Cooperation in Science, Technology and Innovation in 2008. In addition to space, areas of cooperation include information technology, renewable energy, biotechnology, marine and ocean research, nanotechnology and sustainable technologies. A key Brazilian priority is improving its technological work force through student exchanges. The lack of trained engineers, technicians and scientists is a major bottleneck in Brazil’s efforts to modernize its economy, particularly in the space sector. Mercadante said the government’s program of President Rousseff in selecting within four years 75,000 students to study abroad. “We have a proposal to send 30,000 students to the United States, 10,000 to 10,000 for England and Germany. We would love to count on Canada to establish a partnership for the exchange of young people. Students choose to study and cutting-edge internship abroad,” he said. Fast responded positively to the proposal, according to MCT’s account of the meeting. “Presidents of several Canadian universities will soon visit the country and have the opportunity to strengthen the relations of exchange. Our intention is to explore new strategies,” he said. Edward [Fast] also spoke about the visit of Prime Minister Stephen Harper to come to Brazil in August. “For this visit we can study the effectiveness of various partnerships….We put our best entrepreneurs to engage with Brazilian businessmen,” he added. At the end of the meeting were two decisions taken. The first is trying to organize a visit by a delegation of industrialists of Brazil’s space to space companies in Belgium. The other is to promote the training of specialized human resources in universities in Belgium, in engineering and space applications. If the trip goes ahead, the group will be headed by Raupp and make contact with various actors in the space industry in Belgium, currently consisting of more than 40 major companies in the sector for possible trade and cooperation agreements…. According to Montserrat, the interest in knowledge exchange, as agreed last year and reaffirmed by Ambassador Claude Misson, will be key to the Brazilian Space Program. “Currently, the space sector will feel the lack of qualified professionals. Initiatives like these can help to unclog this bottleneck,” says Montserrat. Last year, Brazilian and Belgian signed two bilateral agreements of international cooperation. One focuses on the areas of space, microelectronics, nanotechnology, biotechnology, nuclear energy and human and social sciences. The other targets the academic and scientific exchange between the two countries.